Tears streamed down Karen Culler’s face as she watched her teenage daughter Hannah receive her white coat from the UCF College of Medicine dean. The tears continued as she watched her daughter help deliver a baby from a robot simulator, diagnose a computerized mannequin with congenital heart failure and interview a patient complaining of abdominal pain. The activities were part of Hannah’s December 11 Make-A-Wish Foundation visit to the med school. 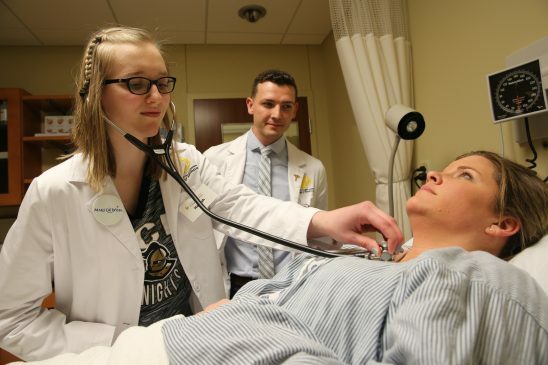 The ailing girl’s dream – to be a UCF medical student for a day. At 18, Hannah suffers from Mast Cell Activation Syndrome (MCAS), a severe immune disorder that causes life-threatening allergic reactions to all kinds of triggers, including food, temperature changes, odors or even being upright for too long. She began having severe symptoms at 11 and was diagnosed at 13. The Ohio native spent almost 200 days last year in the hospital and must take all her classes via computer – she’s a straight A student — to protect her from the world’s triggers. She’s always dreamed of being a doctor and in the fifth grade did a research paper on the top 10 medical schools in the country she wanted to attend. UCF was number one on her list. A member of the family’s church learned of the teen’s wish and contacted Make-A-Wish. The youngster must travel with at least 14 different drugs – including 100 epi-pens in case of an allergic reaction. Though a trip to Orlando was risky for Hannah’s health, she insisted on going to UCF. The trip to UCF was two years in the making and had to be postponed four times because Hannah was hospitalized or too unstable to fly. The last few months have been especially difficult for the teen, who spent two weeks in ICU after a severe reaction to the anesthetic she received for surgery on a broken toe. She also lost one of her best friends, a fellow MCAS patient she met in an online support community. Hannah’s White Coat Ceremony was a last-minute surprise to the day. First-year UCF students wore their own white coats and created a mini “Good Doctor” board for their young classmate. The Good Doctor is a UCF College of Medicine tradition. Each year on their first day of class, Dr. Deborah German, vice president for medical affairs and dean, asks students to list the traits of the doctor they would want caring for their most beloved person. Dr. German writes the characteristics in a chalk board that remains on display at the college the entire year. So students wrote on a small board the traits they had said at their August White Coat ceremony — words like courage, compassion and persistence – and presented it to the teen. Meeting Hannah also “meant the world” to first-year medical student Kevin Petersen, who helped plan the day’s activities. “The White Coat ceremony is the pinnacle of any med student’s life, because it marks the beginning of your journey to becoming a doctor and so I think it was important for Hannah to experience,” he said. Visit https://www.youtube.com/watch?v=VJOsGECWpbc for a video version of this story. The Cullers’ visit to UCF was featured in the Orlando Sentinel and on FOX 35 television.